Traditional 'Taarab' Music Is Revived — And Embraced By Youth — In Zanzibar : Goats and Soda The traditional music known as taarab was fading away — until a school began giving lessons to aspiring musicians. 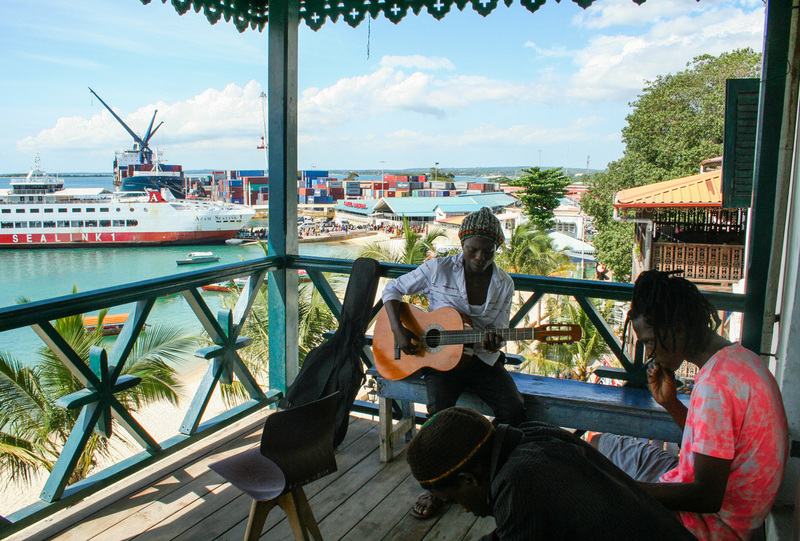 Students at the Dhow Countries Music Academy, dedicated to preserving the music known as "taarab," play on a balcony overlooking Zanzibar's port. Not so long ago, Christopher John's days were spent herding his family's goats and cows in a rural part of Zanzibar, the tropical island off the coast of Tanzania. But he always loved music and used to make whistles out of papaya leaves to play while he tended to his herds. "I like it. I have to learn it," he recalls of the dreams he had when he was 12 or 13, even though his education had stopped after he completed eight years of school. John no longer tends to livestock full-time. At 20, he plays flute in weekly concerts at the Dhow Countries Music Academy, where he began studying in 2011. He's part of a revival of taarab, a traditional form of music that dates to the 1880s. At the time, the island was governed by the sultan of Oman, who brought a taarab ensemble from the Middle East to play in his palace in Zanzibar. Eventually, the music took on African and Indian influences as well, reflecting the island's history as a crossroads of trade. The different musical sounds came in on the dhows, traditional wooden boats, that carried ivory, spices and slaves across the Indian Ocean. Taarab ensembles often feature accordion, violin or the qanun, a type of zither, giving the lively music a Middle Eastern sound. They also include tablah drums and can feature double bass and cello and other instruments. The music took on a Zanzibari flavor when lyrics from Swahili poetry were eventually added. In the 1930s, Siti binti Saad, a renowned Zanzibari taarab singer and daughter of slaves, became the first East African woman to record the music when she sang taarab songs for Columbia Records in Mumbai, India. But the music was fading by the 1990s. Young people gravitated toward pop and "bongo flava," a kind of African hip-hop. "There were only a couple of traditional taarab groups, and very few young people willing to keep the heritage. Taarab was music for 'old people,'" says Adrian Podgórny, managing director of the academy, which uses the acronym DCMA. It was founded in 2002 to revive, preserve and teach taarab. Its founder was legendary taraab musician Mohammed Haji, who is commonly known as Matona, along with German musician and educator Hilda Kiel; Emerson Skeens, a Zanzibar hotelier and culture advocate, and others. Over the years, funding has come mostly from the Swiss Embassy in Tanzania and the Swiss Agency for Development and Cooperation. The Ford Foundation, the Norwegian Agency for Development Cooperation and others have also supported the school. More than 1,600 students have studied at the academy, with nearly 70 percent of them focusing on taarab. The school has revived the art in Zanzibar. In addition to weekly concerts at the academy, students and graduates (along with teachers and old-timers) play the music at hotels, restaurants and cultural festivals on the island and beyond. DCMA's taarab musicians have performed overseas in France, Japan, Kenya, Norway, Switzerland, the United Arab Emirates, the U.S. and elsewhere. DCMA was the first school to teach taarab – and was set up at a time when there was no music education in public schools on the island. Students can enroll in full-time certificate or diploma programs for free and learn to play on instruments that are otherwise too expensive for the average person in Zanzibar. Classes also include history of music and ethnomusicology. Non-diploma and non-certificate students of all ages can study a variety of instruments from guitar to piano. Anyone can take these lessons after auditions to assess skill level. Tanzanians pay about $13 a month for a weekly lesson; rates go up for non-locals. DCMA also teaches music to children with disabilities and to people in Zanzibar's rural areas. Most of the teachers and staff are from Zanzibar, though there are guest teachers who have hailed from Norway, Poland, Spain, the Middle East and other parts of the world. "DCMA is the only institution of its kind in the region. There is nothing like it on the Tanzanian mainland or the Kenyan coast," says Andrew J. Eisenberg, assistant professor of music at New York University in Abu Dhabi. "DCMA is fully integrated into the local music community and has strengthened it in demonstrable ways. For example, some of the faculty members are musicians from prominent Zanzibari musical lineages who admit that they would not have chosen to become professional musicians had the school not existed." John, the onetime shepherd, had heard about DCMA on local radio. When he enrolled, he thought, "'I don't know if I have talent.'" His parents scraped together money for lessons by selling fruit and vegetables, doing manual labor like digging ditches and other work. He was afraid to enter the stately music academy in Stone Town, the historic part of Zanzibar city, because he spent most of his time "in the bush" tending livestock. Today John performs in a taarab ensemble. A singer warbles Swahili lyrics. For his taarab concert this spring, John swapped his jeans and Mr. Pibb T-shirt for a traditional tunic. He swayed as he effortlessly played the flute, which he started studying in 2014 after several years learning guitar at DCMA. Before John arrived at the music school "he knew a couple of guitar chords," says Podgórny. "Now he is good guitar player, composer and a leader of Mcharuko, a promising Afro-fusion group. He is recording his own music and his songs are being aired in local radio stations.'" Although he was born in Zanzibar, John didn't know much about taarab music before DCMA. "Now I know," he says. He earns money from his concerts at DCMA and also performs in hotels and restaurants. His parents are impressed, says John, though he notes regretfully that more of the family's livestock get lost since he no longer tends to them full-time. In his spare time, Matona, artistic director of DCMA, can be found at the academy riffing on an oud, playing a violin or one of more than a dozen instruments he plays. Previously, taarab was played mostly by elders who were literally dying off, he explains. "The music tradition was disappearing." Now Zanzibar's taarab is "well-known in the world, in Norway, Amsterdam, New York," he says. In addition to teaching taarab, DCMA also offers private lessons in other musical genres, including ngoma drumming, Afro-fusion, jazz, funk, pop and classical. Robert John, for example, learned to play piano at the academy when he was in his mid-20s. As a boy in northern Tanzania, John (no relation to flutist Christopher John) fell in love with music when listening to his transistor radio while tending to cows in pasture. John says he "didn't like the news" but loved Celine Dion and Kenny G.
He came to Zanzibar to work as a security guard for three years before quitting to study piano at DCMA in 2006. He had never seen the instrument before. "What is the meaning of 'piano?'" he recalls asking his teachers. John, now 38, had never attended school and was illiterate. He'd walk 90 minutes from his home to the academy for piano lessons. People told him he was "possessed," he says. John eventually learned to read music — and then to read Swahili. Matona was John's piano teacher. He remembers his surprise when he realized his student was illiterate. John's notebook was full of drawings and no words. "Why didn't you tell me?" Matona asked. John's introduction to piano was difficult. "The first months were a nightmare for him," says Podgórny. "But after a year, Robert began to use the instrument better and better and began to understand the theory of music." After years of hard work, John earned a diploma from DCMA in 2016 and became a piano teacher at the academy. He will also start teaching piano at the International School of Zanzibar in October. One humid afternoon, dressed impeccably in a collared shirt and slacks, John played Chopin and Beethoven on an upright piano at the academy. Then his hands glided over the keys as he played pop songs "(Everything I Do) I Do It For You" by Bryan Adams followed by Vanessa Williams' "Save the Best for Last." A cacophony of sound spilled out from practice rooms: drums, violins, electric guitars, bass, flutes and piano. Students strummed guitars and trilled flutes on a balcony commanding a view of the azure waters of Zanzibar's port. These days it is busy with container ships and high-speed ferries to mainland Tanzania – as well as the occasional dhow skimming the ocean, just like in the days when taarab first came to the island. Amy Yee has written for The New York Times, The Economist, NPR and other outlets. She is a former staff journalist for the Financial Times.